Colorado Rockies fans will not soon forget Trevor Story‘s jaw-dropping first week. He hit seven home runs in his first six games and propelled the Rockies towards a successful April. But would all of this have happened if veteran utility infielder Daniel Descalso never got hurt? 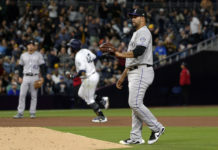 Descalso fractured his left hand in spring training, which took him out of action until Thursday night when the Rockies played the St. Louis Cardinals. Lets go back in time to March. Jose Reyes is in trouble with domestic violence charges and out of action as he awaits formal decision from commissioner Rob Manfred. The Rockies are starting to look for someone to replace Reyes at shortstop until the charges clear and he can return to play. Frontrunners Descalso and Cristhian Adames are getting the majority of the reps with the big league club. Sitting in minor league camp is a young prospect named Trevor Story. Story is a right-handed hitter who has shown minimal power through his minor league career. His glove is average and his arm is nothing to get excited about. It does not seem like Story will set foot at Coors Field anytime soon. Adames is the Rockies’ top prospect at shortstop, who has steadily worked his way through the minors. Story, on the other hand, has been bouncing around from team to team. Coming into spring training, Adames already has 68 major league at-bats under his belt. Unlike Story, Adames is a switch hitter with a vacuum for a glove and a plus arm. Baseball America has ranked Adames the best defensive player in the Rockies farm system. Both Descalso and Adames are similar players. Both have average bats, but both are outstanding fielders with rockets for arms. At this point, the Rockies have two power bats in their lineup with Carlos Gonzalez and Nolan Arenado, so they aren’t looking for another big bat. 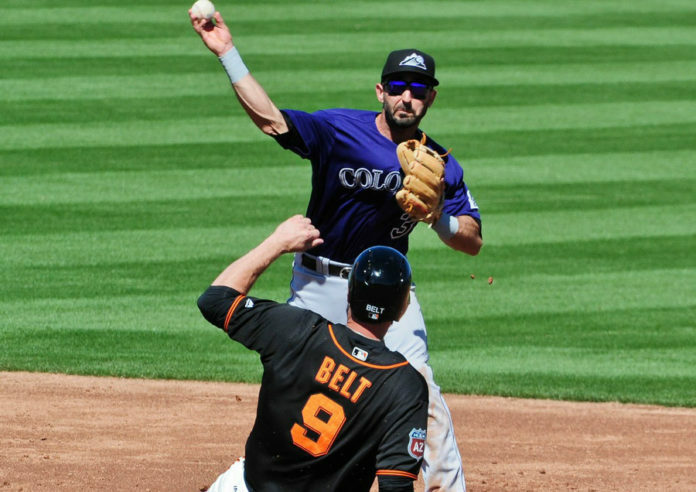 With the Rockies looking for a solid defensive shortstop, it looked like Descalso would be starting at short on Opening Day, and instead of breaking onto the major league scene, Story would be continuing to develop in Albuquerque, New Mexico. But lo and behold, Descalso goes down with an injury early in the spring and Story gets big league at-bats. He amazes coaches with his power numbers, hitting .340 with six homers, tying Arenado for the spring. Those numbers impressed coaches enough to give Story the Opening Day start over Adames, and of course, the rest is history. If Descalso didn’t get hurt it’s easy to believe that Story would be nothing more then a bench player. 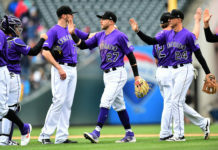 There never would have been the storybook first week, and the Rockies momentum would be nowhere near where it is now. So is Descalso’s injured left hand really to thank for the Rockies success? Forget the pitching, lets start praising Descalso for getting hurt. 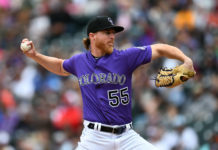 If not for that fateful day in March, the Rockies season and Trevor Stroy’s career may look very different.